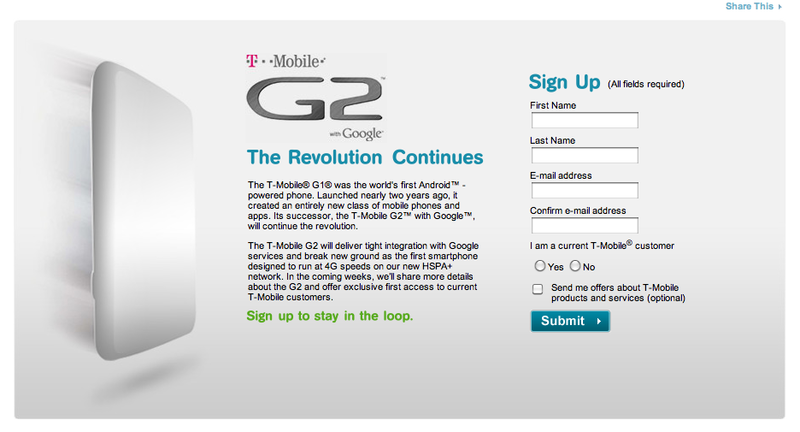 You are here: Home > T-Mobile G2 to Release On September 29th? T-Mobile G2 to Release On September 29th? As it stands at the time of this writing, we have absolutely no idea what the T-Mobile G2 actually looks like. We have no idea what the phone really contains on the inside, spec wise. We really don’t know anything except that its T-Mobile first HSPA+ phone. We know a pre-sale of some kind is going to take place and its looking like part of it is geared to current customers. That being said, we have been running under the assumption that based on the leaked roadmap that the phone would release sometime in early September, more specifically the 9th. As it stands now, as we just got hit up by one of our trusty ninjas the phone will actually be ready for release close to the end of September, more specifically the 29th with a pre-sale happening before that. We can’t confirm this date as of yet so we urge you to take it with a definite grain of salt as it’s certainly possibly and we are hopeful it could release sooner. However, the 29th sounds about right because I’m betting if the phone were to release on the 9th details regarding the pre-sale would have been not just leaked by now, but publicized by T-Mobile themselves. So for now, we’re penciling in the 29th of September as a maybe, but it certainly sounds about right. ← T-Mobile to Hear (Dell) Thunder? Hoping that an upgrade from the Nexus One won’t be too much. I really want a QWERTY keyboard. What makes you think this phone will be an upgrade over the Nexus ? Any new highend phone coming out is an upgrade over the Nexus One lol Samsung Vibrant, Droid X and 2 all are upgrades compared to Nexus One. Dude you dont know what your talking about… The N1 is still the best android phone on the market… and probably will be until the end of the year phones roll out. My N1 is amazing. 4 of my reps sport the vibrant and its great dont get me wrong but i wouldnt trade my phone for it. Trust me. i live and breathe phones. some people dont understand what a nexus one really is lol… oh well. Oh No! Are the number keys combined with letter keys? Well one thing for sure is that it will have a processor higher than 1 ghz. 1 ghz does not support HSPA+, so i think it should have the 1.2 ghz processor. While I hope that it does have greater than a 1ghz processor. Most sites that I’ve seen are reporting it at 800mhz or with possibly dual 800mhz. Where do you get that information. As far as I have gathered it would either be an MSM7230 which is single core 800MHz to 1GHz….or….QSD8672 Dual Core also 800MHz to 1GHz. Do you have other information? Don’t think anyone has mentioned release of MSM8260, MSM8660, or MSM8270. “1 ghz does not support HSPA+” ??? ok, that’s misinformation. a radio is a radio. Ok, thats great people are speculating this phones release date but where are the three most important things….the pictures, the specs and the price. Catch our blog post that has the pics! You guys can take this for what its worth since more than likely most wont believe. I work really close with the folks at HTC. I speak with their reps often. every few months really. Their last visit was about last week Thursday…. so far the info he has given me hasn’t proven wrong. He said g2 was hspa+ he said it is basically a desire with a slide out keyboard, and he said that it will be coming in September! Big C, we didn’t get into any of that other than the fact that picture/spec wise… like i said.. he said Desire with keyboard. Like i said, take this for what it is worth. Believe or not. Just thought I’d pass this on. I believe your right if you check out http://www.mobiles.co.uk/htc-desire-z.html they have released spec on the desire z, which sounds a lot like what the G2 has been rumored about. So if the G2 s the same as the desire z them it looks like its a 1ghz processor with only a 3.7 inch screen (personally i was hoping for 4 inches or larger)… they also released the specs for the desire hd, which sounds like what the mytouch hd is going to be.. go check it out. So if your analysis is correct, then the Mytouch HD aka HTC Desire HD will have a 4.3 inch screen with 720p video recording. WAIT!!!!!!!! Phandroid reported a fews ago about Project Emerald being a dual launch of G2 and mytouch HD in the month of Sept. the launch dates are the 22nd and 29th. your source said the 29th and if that is true then there’s no way that this report and the other report is mere coincidence. So hopefully the myTouch HD comes out too! I don’t know about that other report, I don’t see anything about the MyTouch HD being launched in September. Yeah, I don’t think T-Mobile would release two flagship devices within a week of each other. Both the G2 and the MyTouch HD are T-Mobile brands(as in they’re not just T-Mobile branded, they are the phones T-Mobile uses to promote the T-Mobile name). It WOULD be a rather bold move and interesting to see, but I’m gonna go with the leaked roadmap and believe that the G2 is the Vanguard and the MyTouch HD is the Emerald, which means we’ll see the MyTouch HD in November. So coicidence.. I Dunno, Time will tell. HTC will be revealing these phones on September 15th in London so maybe the maytouch HD will launch on the 29th but not here maybe in UK or they will Launch both phones here one with a keyboard and one with out. Heres hoping the iPhone gets to tmobile by the end of q3 like was said smewhere before. But who cares iPhone is old news. I wonder if Tmobile will cripple the tethering that is built into froyo on the new G2 and myTouch HD. Of course they will. You can’t expect them to swallow ALL of the extra bandwidth used by tethering for free. No one offers free tethering, and no one is going to start soon. i was really hoping for the 9th, but it does make sense. If this thing released around the 9th we’d be seeing so much more info now and we arent.I still hope it releases during the 9th so i can finally get rid of my blackberry. the thought of having to wait 2 extra weeks is a pain. I agree, I’m still using my Curve 8320, no 3G, my bluetooth quit working and so did my camera (dropped it once or twice). I’ve had it for over two years, this is getting very hard to take, I almost bought a Vibrant but with only a month or two to go, I’m going to try to wait. All of you all wrong. You will be shocked to see what this phone really is. Either offer what you know or don’t offer anything. I hate when people drop comments with no substance. All of you are right. Because we have all seen the damn thing already. Oh and you guys will be shocked when you see what this phone can really do.. it transforms into Megatron and then starts creating a transformers army out of all your old phones. Like I said you will all be shocked. I wouldn’t bet that the Desire Z would have the same specs as a release in the states. Two different markets, two different development paths. Look at the Galaxy S and the different versions for the different carriers. I just wanna see pics of this thing. Okay – if you all look at the leaked road map, you will see diamonds next to some products. All of the products that have been released with a diamond next to them are android devices. The only two HTC devices that have diamonds next to them are scheduled to be released on 9/9 and 11/9. The other HTC being released on November 17 must be WinMo. If the G2 is being released on 9/9, that leaves one device for the year which is the HD – slated for November. It also looks like we can expect two more Motorola and one LG android device(s) this year. after blowing the image up, those are not diamonds, but little android guys.. lol! Just seeing that now huh, lol indeed. Oh well, I guess they are a little blurry. I agree, there are all of these speculations and rumors, but so far the roadmap that was leaked a while back has been pretty accurate, first the Vibrant, then the Charm, and we are getting close to the Vanguard (I think the G2) and then the Emerald (probably the Desire HD) in November. Unless T-Mobile reacted to the leaking of the road map and is pushing up the release, I would say that it is the best indicator, 09/09 and 11/05 or is it 11/09 (can’t tell it’s kinda blurry). if its the htc desire hd ill switch from the iphone4. if it has a genius button w a pull out keyboard…no deal i mean it does kinda look like it. you can see what looks to be a kickstand on the back?!?! Until I find out more about the Project Emerald phone I won’t be buying anything!! I want power and some fun factor in my next phone! I could take a dump in a box and it would be an upgrade to the nexus one. certainly would receive better 3G reception, I am sure. Oh, and HSPA+. With Qualcomm’s dualcore 1.5GHz snapdragon and Android 3.0 expected to come out late 2010/early 2011, a September release may mean that this phone will be easily forgotten come early 2011 by another carrier… ala the G1 when the Hero was released soon afterwards. Hope I’m wrong and tmo gets the goods early. Has Google attended any TMO press conferences since the G1? How soon are we forgotten. So are you one of the idiots that was on here a few days ago bragging that you all knew for fact that this thing was a dual core phone? I forgot to mention that, i did ask about the MyTouch HD…. what he told me is there was no duel launch. the HD according to him would be coming out around November, b4 black Friday. unfortunately he couldn’t give me any more details about the phone. Especially considering the Desire HD will have one, and this myTouch is supposed to be a slight variation of that device. So if the Mytouch don’t have a 4.3in display then I see no point in making everyone wait until Nov. for another lame myTouch device. And the leaked pics definitely don’t make it seem to have a 4.3in screen.. I would guess 3.9- or 4in, similar to the Vibrant. Finally A CONFIRMED FOTO of the g2 now for the specs……………. I’m kind of disappointed that it doesn’t have a five-row keyboard, did the original? The original has a 5-row, yes. Have you checked what day the 29th is? Yeah its a Wednesday, why is that vague? I may get one of these and I deploy nexus one on webconnect line. i went into t-mo yesterday to get the vibrant and i asked the rep have they heard any thing and she said she just got an email about the phone. and it might be coming out 1 1/2 to 2 months because a month b4 it is release they know everything(date, spec, ect..) and have gone through all the training for it. we do the trainings when they send it to us, and the information we get about specs/launch arent available until they feel like updating us, usually a few weeks later than tmonews has them, and not always a month before the phone releases. I know with the charm weve been trained on it for a while, but that phone never seems to come out. but the vibrant and hd2…i had the phone in my hand while doing the trainings. Can’t wait for this…this will be my 4th phone in a year! G1, N900, and now HD2 until the G2 is released! Its funny when I go to chat with my local reps about phones and stuff, there is always one rep in paticular that is always there, and always fricking lying to me about what he knows, I ask about the G2, and I get the runaround that they only know what has been made public…BS, I have L.E. training and I can tell when someone is BS’ing. And its only this one rep, the other ones, they are cool as hell, if I ask they tell me what they know or have heard straight up. But that one rep, man would be too much to simply wink for yes when I ask a question of they are so scared of getting busted, I would love to punch the one rep right in the face, always a douche bag. I am not asking for the most cutting edge phone from TMO, but I would like to hear that they will roll out something that is on par with what Verizon is offering. This one rep seriously makes me want to leave TMO, but then when I finally chat with the cool reps, I feel better about waiting for a good phone cause they have a great attitude. Would anyone even consider buying this if it had a sub 1Ghz processor i mean lets face it vibrant just seems like a more logical choice if the processor is a weak one, and knowing Tmobil it just might be….. I hope it does, that’s my birthday lol. HTC Rep confirmed this to me today, it will have a duel core 800 mhz processor! Anything less than a 1ghz single-core will be a disappointment, or rather, a failure. Personally, I believe since the G1 began the whole Android thing, this time, it should set the standard in hardware. I really love everything about this phone. I really like what looks like a tackle-box-opening-style slide and am very anxious to see how well it flip/slides open. As long as the stats are appropriate, it will be in my pocket as soon as available. It will print money and grant me 3 wishes. What about the bigger GBs and the wifis? haha funniest thing on youtube right now. be warned if you don’t like swearing ask a friend to watch it for you and tell you some funny clean lines from it.